Shortly after Florida defeated Arkansas 38-28 in the 2006 SEC championship game in Atlanta's Georgia Dome, then-Gators coach Urban Meyer immediately started lobbying for his team to play for a BCS national title. The Gators were No. 4 in the BCS standings at the time, behind No. 1 Ohio State, No. 2 USC and No. 3 Michigan. After the Trojans were upset 13-9 by unranked UCLA, Meyer believed the Gators were the most deserving one-loss team to get a chance to play the undefeated Buckeyes. 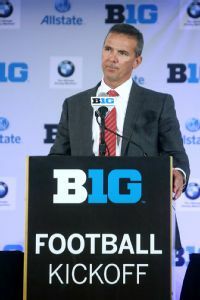 "There are a lot of people making a lot of decisions out there, but this is a big one," Meyer said at the time. "We're going to tell a group of young men, who just went 12-1 in a most difficult schedule against six ranked opponents, that they don't have a chance to play for a national championship? I'm going to need help with that one." Jerry Lai/USA TODAY Sports Urban Meyer once lobbied on the merits of the SEC schedule, but now finds himself defending the Big Ten slate. Of course, the 2006 Gators ended up leaping past Michigan, which lost to Ohio State during the regular season, for the coveted second spot in the final BCS standings. Then Florida blasted the Buckeyes 41-14 in the BCS National Championship Game, starting the SEC's unprecedented streak of seven consecutive national titles. Oh, how the times have changed in college football. After a wild weekend, Meyer now finds himself on the other side of the argument. He has guided Ohio State to back-to-back undefeated regular seasons; the Buckeyes beat rival Michigan 42-41 on Saturday, marking their 24th consecutive victory. OSU won after Tyvis Powell intercepted Devin Gardner's two-point conversion pass with 32 seconds to go. Surely, an undefeated Big Ten team is more deserving than a one-loss SEC team, right? Well, No. 3 Auburn thinks it has a legitimate argument after stunning two-time defending BCS national champion Alabama 34-28 in the most improbable of endings on Saturday night. With one second to play in the Iron Bowl, Alabama's Adam Griffith attempted a 57-yard field goal to win the game. But his kick was short, and Auburn's Chris Davis caught the ball 9 yards deep in the end zone. Davis returned the miss for a touchdown, giving the Tigers their most memorable victory in the Iron Bowl, along with an SEC West title. It didn't take the Tigers long to start lobbying for the No. 2 spot in the BCS standings. Florida State, which finished its 12-0 regular season with a 37-7 rout at Florida on Saturday, is ranked No. 1 in the BCS standings for the first time since 2000. Ohio State is No. 2, followed by Auburn and No. 4 Alabama. If Florida State defeats Duke in Saturday's ACC championship game in Charlotte, N.C., and Ohio State and Auburn each win their conference title games, which team is more deserving to play the Seminoles in the final BCS National Championship Game at Rose Bowl Stadium on Jan. 6? The undefeated Buckeyes, who haven't lost in two seasons, or the Tigers, who are 11-1 against a more rugged schedule? Ohio State would have defeated six teams -- including No. 10 Michigan State in the Big Ten title game -- that are projected to play in bowl games (Penn State is ineligible for the postseason because of NCAA sanctions). Auburn would have defeated nine, including Missouri. Ohio State would have defeated five FBS teams that finished the season with losing records. Auburn beat two FBS teams with sub-.500 records. Ohio State's 12 FBS opponents, including Michigan State, have a combined record of 73-71 going into the Big Ten championship game. Auburn's 12 FBS opponents -- including No. 5 Missouri in the SEC championship game -- have a combined record of 88-56. Of course, Ohio State and Auburn still face difficult upcoming tests in their conference title games, so the argument might end up being moot by Saturday night. What if both teams win? What if both of them lose? Either way, the final season of the BCS system figures to end in some sort of controversy, like many of the preceding ones. The Seminoles roll past Duke, which looks overmatched on paper at least, and Ohio State runs past the Spartans in its most impressive victory of the season. Beating an opponent of Michigan State's quality would squash any doubts about the legitimacy of OSU's long winning streak. The Spartans have won eight consecutive games since losing 17-13 at Notre Dame on Sept. 21, and they're allowing only 11.8 points per game, ranking fourth among FBS teams. If Ohio State loses to Michigan State and Auburn beats Missouri, the Tigers will play FSU for the BCS national title. Even if Ohio State wins but struggles against the Spartans, might voters in the Harris Interactive Poll and USA Today coaches' poll bump Auburn ahead of the Buckeyes, especially if the Tigers win convincingly? On Sunday, Auburn trailed OSU by only 25 points in the coaches' poll and 66 points in the Harris poll. An impressive victory over Missouri, which went 11-1 in its second season in the SEC, might be enough to move Auburn past OSU in the BCS standings if enough voters are swayed. If Ohio State loses and Missouri beats Auburn, voters might have a hard time ignoring the SEC champions. Missouri's only loss was a 27-24 defeat in double overtime against South Carolina on Oct. 26. The Tigers blew a 17-0 lead in the fourth quarter of that game, and lost after kicker Andrew Baggett bounced a 24-yard field goal off the left upright in the second overtime. If not for that loss, Missouri would probably be sitting in the No. 2 spot in the BCS standings. If Ohio State and Auburn both lose their respective championship games, could Alabama emerge? The Crimson Tide fell to No. 4 in the BCS standings after losing to the Tigers on Saturday, but might they get the benefit of doubt from voters after losing on such a fluke play? Would Alabama remain ahead of Missouri, even if the Tigers win the SEC title? The Crimson Tide had won 15 consecutive games before falling in the Iron Bowl. And there's precedent: Alabama won the 2011 BCS national championship after failing to win the SEC West. The Crimson Tide lost to LSU 9-6 in overtime during the regular season, but then reached the BCS title game after Oklahoma State lost at Iowa State late in the season. The Crimson Tide defeated LSU 21-0 in New Orleans to win the national title. It might be far-fetched, but what if Duke beats Florida State and Michigan State defeats Ohio State? Under that scenario, the SEC championship game winner would probably move into the No. 1 spot (Auburn would undoubtedly win on a 75-yard touchdown on a hook-and-lateral on the final play) and Alabama would probably finish No. 2. Remember 2007, when No. 1 Missouri and No. 2 West Virginia both lost in the final week, allowing No. 3 Ohio State and No. 7 LSU to slide into the title game? Who wouldn't want to watch an Iron Bowl rematch at Rose Bowl Stadium? Alabama Gov. Robert J. Bentley might have to call in the National Guard during the monthlong buildup. Buckle up. After this past weekend, nothing seems impossible in the final season of the BCS. Thankfully, Southern Miss ended the country's longest losing streak at 23 games with a 62-27 victory at UAB on Saturday. The Golden Eagles trailed 21-13 at the half, but then outscored UAB 49-6 in the second half. Southern Miss avoided suffering back-to-back winless seasons, which has happened only once in the past 30 years. Southern Miss quarterback Nick Mullens threw for 370 yards with a career-high five touchdowns and also ran for another score. "It's special," said Todd Monken, who won his first game as the Golden Eagles' coach. "It's why you do it. I don't even know what else to say. At times you forget why you work so hard, and it's for that feeling. It was nice to be able to have that happen so our guys could remember that feeling." Kim Klement/USA TODAY Sports Florida's offense was difficult to watch this season. Florida's ugly loss to Florida State in the Swamp on Saturday, its seventh consecutive defeat, was pretty much a microcosm of its forgettable season. UF's defense played hard and limited FSU's high-powered offense to only a field goal deep into the second quarter. But after FSU quarterback Jameis Winston threw two touchdowns to Kelvin Benjamin in the final 4½ minutes of the first half, the game was all but over. Florida's offense wasn't capable of coming back. 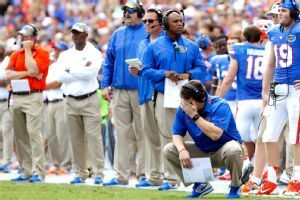 To no one's surprise, Florida coach Will Muschamp fired offensive coordinator Brent Pease and offensive line coach Tim Davis on Sunday. The Gators ranked 107th in passing (170.9 yards per game), 113th in scoring (18.8 points) and 112th in total offense (316.7 yards). UF athletic director Jeremy Foley made it clear on Saturday that Muschamp is coming back after this season's 4-8 disaster, but he expects big changes on offense in 2014. "We do have to fix that side of the ball," Foley said. "No disrespect to anybody, that's just reality. You look at the stats and some of the scores that have caused us problems. We'll get that fixed and we're going to have to get that fixed, and I think we can." What David Cutcliffe has accomplished at Duke, of all places, has only been duplicated at a few other schools. Bill Snyder did it at Kansas State, and Art Briles is doing it at Baylor. After inheriting a program that went 2-33 in the three seasons before his arrival, Cutcliffe guided Duke to a 27-25 win at rival North Carolina on Saturday, which clinched the school's first 10-win season and first ACC Coastal Division title. The Blue Devils have won eight games in a row, defeating then-No. 14 Virginia Tech and then-No. 23 Miami in the process. "He's the first one to really come here when the team was in the dumps and say, 'I'm going to change this program around,'" quarterback Anthony Boone said. "And people were laughing at him. It all goes back to him." We're guessing Ed Orgeron's campaign to become USC's full-time coach all but ended with Saturday night's ugly 35-14 loss to UCLA at the Coliseum. It was the Bruins' first win at USC since 1997 and largest margin of victory over the Trojans since 1970. There's been a seismic shift in Los Angeles over the past couple of seasons. USC crushed UCLA 50-0 at the Coliseum in 2011. UCLA beat USC 38-28 at Rose Bowl Stadium last season. "You win two in a row in this town, and things start to change," UCLA coach Jim Mora said. "If I'm a high school player, I want to play at UCLA. ... There's nothing like tonight. You don't get that in the NFL. That was more exciting than the dang Super Bowl." Auburn's Chris Davis will forever be remembered for his 100-yard return of a missed field goal on the final play of Saturday's Iron Bowl, but Tigers quarterback Nick Marshall was just as important in their 34-28 upset of No. 1 Alabama at Jordan-Hare Stadium. Marshall, a former Georgia defensive back, completed 11 of 16 passes for 97 yards with two touchdowns while running for 99 yards with one score on 17 carries. His 39-yard touchdown to Sammie Coates tied the score at 28 with 32 seconds to play, setting up one of the most dramatic finishes in college football history. Fales completed 37 of 45 passes for a school-record 547 yards and six touchdowns in San Jose State's 62-52 win against Fresno State. He is the seventh FBS quarterback in the past 10 seasons to pass for at least 500 yards and six touchdowns in a game without throwing an interception. Carr passed for 519 yards and six touchdowns in Fresno State's 62-52 loss at San Jose State. He is the third FBS player in the last 10 seasons to pass for at least 500 yards in back-to-back games. Oklahoma's Landry Jones did it against West Virginia and Oklahoma State in 2012, and Houston's Case Keenum did it against Southern Miss and Tulsa in 2009. Hackenberg, a true freshman, passed for 339 yards and a career-high four touchdowns in Penn State's 31-24 win at Wisconsin. It was his first game without a sack or an interception and his fourth 300-yard passing game, tying the mark of Matt McGloin (2012) for most in a season in school history. Seiman completed 31 of 44 passes for a career-high 414 yards and four touchdowns in Northwestern's 37-34 win at Illinois. It was the 10th-most passing yards in a game in school history and the most since Mike Kafka had a school-record 532 against Auburn in the 2010 Outback Bowl. Gardner completed 32 of 45 passes for 451 yards and four touchdowns in Michigan's 42-41 loss to Ohio State. It was his second career game with at least 400 passing yards, the only two such games in school history. He is the first player to throw at least three touchdowns in the fourth quarter against a Big Ten defense since Hawaii's Colt Brennan did it against Purdue in 2006. While officially a quarterback, Lynch continued to do major damage on the ground. He had 27 carries for 321 yards and three touchdowns in Northern Illinois' 33-14 win against Western Michigan. He broke his own FBS record for most rushing yards in a game by a quarterback, which he set on Oct. 19 with 316 at Central Michigan. Lynch is the fifth player in FBS history to have at least 20 passing and rushing touchdowns in a season. That list includes three players during their Heisman Trophy-winning seasons (Johnny Manziel, Cam Newton and Tim Tebow). Hyde had 27 carries for 226 yards in Ohio State's 42-41 win at Michigan. It was the most rushing yards ever by an Ohio State player against Michigan. Hyde has run for at least 100 yards in seven straight games, tied for the third-longest active streak in the FBS. Mason had 29 carries for 164 yards in Auburn's 34-28 win against Alabama. He is the third player in the past 10 seasons to rush for at least 150 yards against Alabama, joining Arkansas' Darren McFadden in 2007 and Minnesota's Marion Barber in 2004. Mason had an SEC-high 13 rushing touchdowns in SEC games this season; Auburn had five rushing touchdowns in conference games last season. Byrd had 26 carries for a career-high 251 yards and three touchdowns in North Texas' 42-10 win at Tulsa. His 91-yard touchdown run in the third quarter was the longest by a Mean Green player since 1995, when Cedric Cromer went for 95 against Idaho State. On senior day, Tipton ran for 216 yards and four touchdowns in Central Michigan's 42-10 win against Eastern Michigan. It was his second career 200-yard rushing game. Tipton entered the season on the Doak Walker Award watch list but missed seven games because of a broken ankle. Benjamin had nine receptions for three touchdowns and a career-high 212 yards in Florida State's 37-7 win at Florida. It was the first 200-yard receiving game for a Florida State player since Craphonso Thorpe had 217 at Notre Dame in 2003. Adams had 13 receptions for three touchdowns and a career-high 264 yards in Fresno State's 62-52 loss at San Jose State. It was his third game this season with at least 200 receiving yards and three touchdowns; no other player has had more than two such games in his career since at least 2000. In his final regular-season game, a 36-35 win against Oregon State, Huff set career highs in receptions (nine) and receiving yards (186). He has 23 touchdown receptions in his career, fourth-most in school history behind three players tied with 24. Davis had eight receptions for 171 yards and a career-high four touchdowns in UNLV's 45-19 win against San Diego State. It was his seventh career 100-yard receiving game, his fifth this season. Cooper had six receptions for a career-high 178 receiving yards in Alabama's 34-28 loss at Auburn. He had a 99-yard touchdown reception in the fourth quarter, the longest reception in Alabama history. The previous record was 94 yards set by Michael Vaughn against Florida in 1996.